This post was originally published March 26, 2014. After weighing the various outstanding projects, and taking into consideration the weather, which has not been that great (therefore prohibiting outside projects), I decided to tackle some bathroom upgrades. Our home has one full bath on the second floor, and a half bath / laundry room on the first floor. The huge clawfoot bathtub in the main bath was one of the things that I loved about our house when we bought it. However, the already tiny bath was painted dark blue, was lit by a single, rather anemic overhead light, and had a vanity that stole most of the space and didn’t provide efficient storage. Furthermore, within a month of living in the house, all the towel racks had become dislocated from the wall due to improper anchoring (and a toddler). 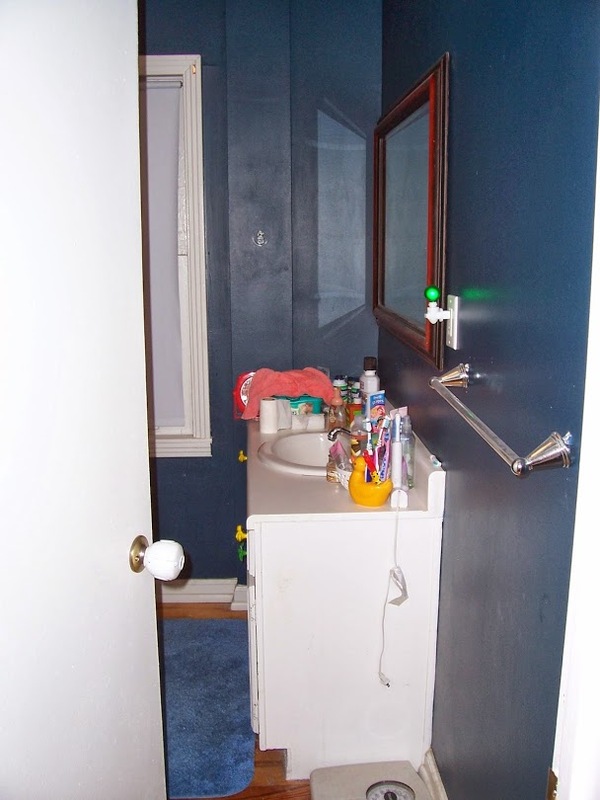 This photo is from the hallway, and you can see how tiny the bath is, and how the dark paint, poor lighting, and oversized vanity make it appear even smaller and darker. The single receptacle, while placed conveniently, was not enough. Note the dangling, and therefore unusable, towel rack in the foreground! The window, which faces full west, was so shrunken that you could see daylight around the sashes. The vinyl shade was not only unattractive, but frequently fell on one’s head when one would try to lower or raise it. The overhead light was completely insufficient to light the room, especially when it had to compete with the dark blue paint. Towels had to be hung over the shower, due to the aforementioned towel rack issue. 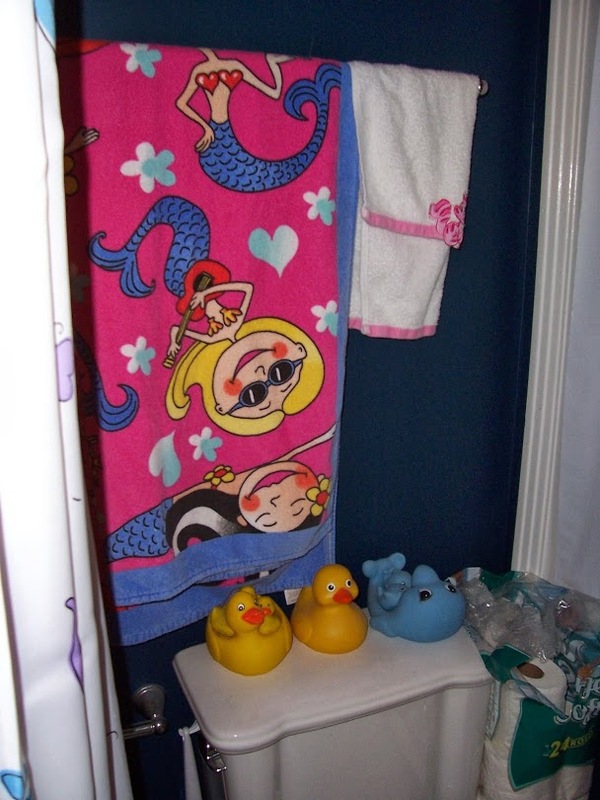 The only towel rack that hadn’t come loose was over the toilet tank – not the most convenient spot! 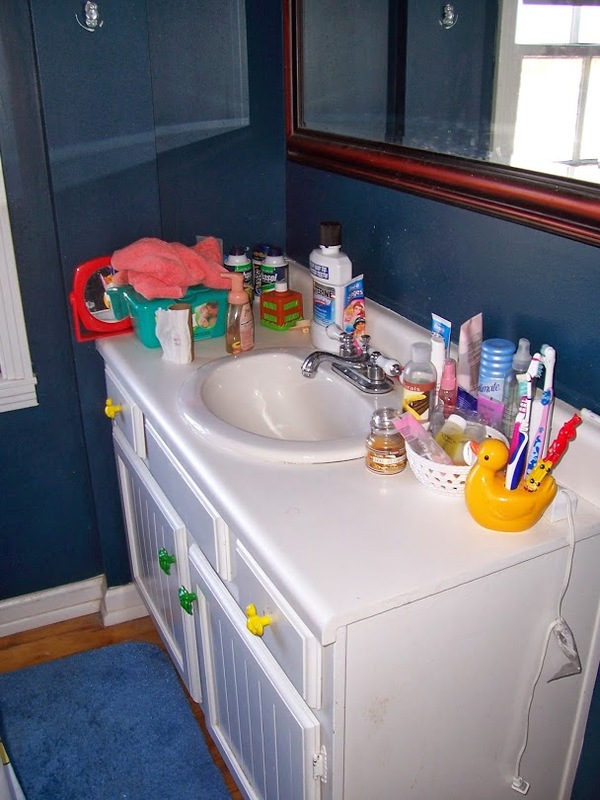 The vanity, while too large for the room, was not unattractive, but the storage area underneath was basically unusable. The inside was one large open area, and had at some point been damaged by water. Only the outside of the vanity was white – the inside was dark brown, making it impossible to see anything stored inside. The doors could not swing fully open, due to the size of the room. One of the first things that we did was replace the window. Pella had windows the size and design that we wanted, with reproduction hardware, removable grills, and double-tilt sashes. However, since our house was built in 1918, the windows are quite large. One new window and screen cost close to $800. 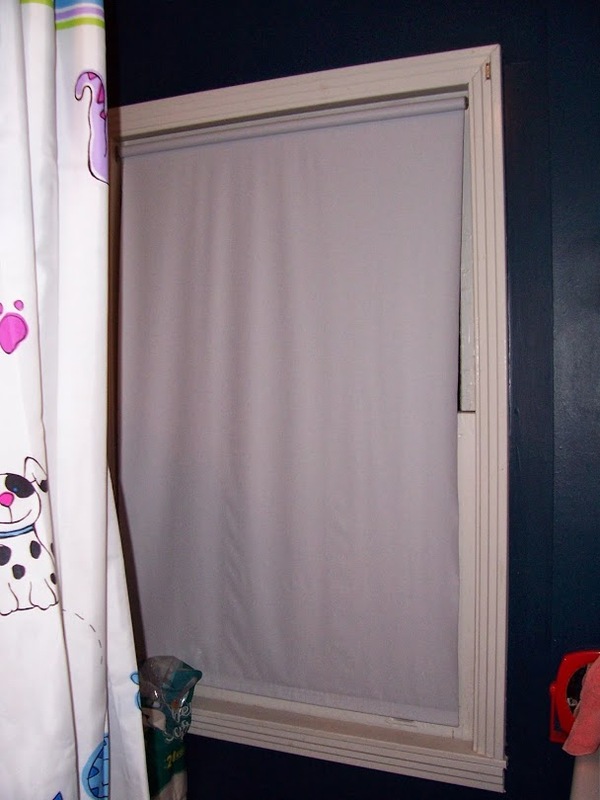 So we ordered one Pella window from Lowe’s, and installed it ourselves, with the help of my engineer dad. 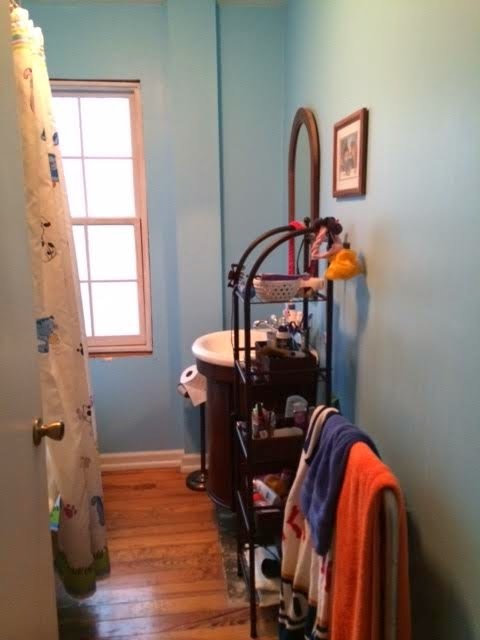 Next, I removed all the towel racks, patched the damaged drywall, and bought a free-standing towel warmer. I am not sure how I ever lived without a towel warmer! We replaced the weak overhead light with a nice dual bulb light from Lowe’s. 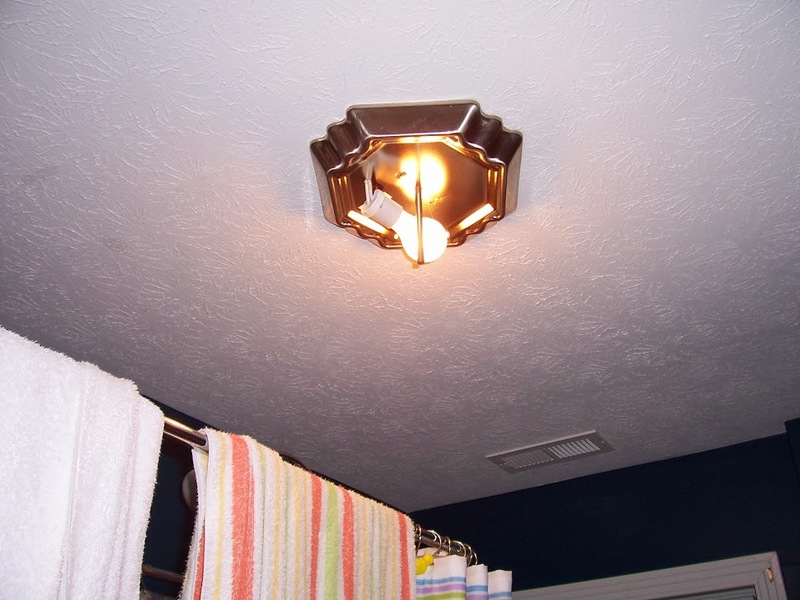 Of course, the matching sconces that would have been perfect for the bathroom had been discontinued! Around the same time, we replaced the tub filler, shower, and shower ring for the clawfoot bathtub. Then, all in one long weekend, we removed the vanity and repainted the bathroom. However, when we demoed the old vanity, we found that there was vinyl tile installed underneath it. After scratching our heads over this discovery, we finally discerned that at some point the bath had vinyl tile installed over the hardwood floors, then the vanity was installed on top of that. When the house was cosmetically remodeled a few years before we bought it, the vinyl was removed except under the vanity. Consequently, there is a vanity-shaped area on the hardwood floor that will need to be refurbished. We replaced the vanity with a free-standing cherry vanity with sink and matching mirror from Home Depot. Home Depot had just started carrying the free-standing vanities at that time, and we got a great deal on it. We also installed a new Pegasus faucet on the sink. And we painted the whole room a very pretty robin’s egg blue. With the vanity gone, we needed a place to put our “stuff”, so we picked up a narrow shelf unit with little baskets on it to go next to the sink. The light blue paint and new vanity made the room look completely different, and so much better! This is the new starting point for the work that I am planning going forward, which will include new lights for the vanity, a second receptacle, a bathroom ventilator, white beadboard and built-in shelves, and new trim and molding throughout the room.